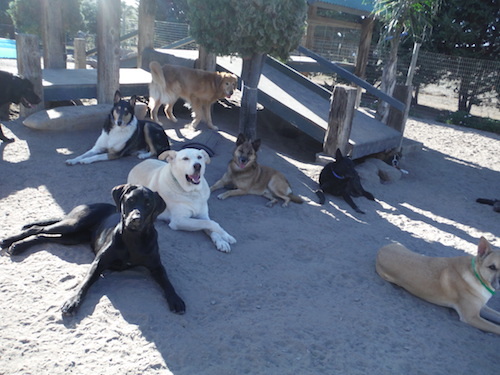 At Two Rock Dog Ranch, your pup will enjoy the companionship of canine and human friends all day, every day. Dogs play with our handlers, work out with high-speed games of chase, or enjoy leisurely sniffing expeditions. There are plenty of comfy dog beds and blankies for snuggling and snoozing wherever — and whenever — they choose. Each dog receives lots of individual attention from human companions — pets, hugs, games and chats — all at no extra charge! 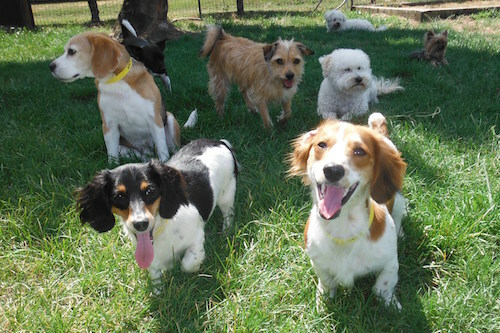 Day Care – all day play is included with an overnight stay! All of the dogs stay cozy on cold nights in our well-insulated, heated facility. Soothing music is played throughout the night. Dogs sleep the night away in their own private space, next to their friends. We provide bedding or you may bring your dog’s bedding and/or a scent reminder from home. Dogs are monitored on closed circuit television while they sleep.